On the 14th (Mon), stroll through Wilderness Beach. To find reviews, photos, more things to do, and tourist information, read Wilderness travel planner. Cape Town to Wilderness is an approximately 3-hour combination of flight and taxi. You can also drive; or take a bus. August in Wilderness sees daily highs of 21°C and lows of 9°C at night. Finish your sightseeing early on the 14th (Mon) to allow enough time to drive to Oudtshoorn. On the 15th (Tue), tour the pleasant surroundings at Cango Wildlife Ranch, then explore and take pictures at Swartberg Pass, and then explore the fascinating underground world of The Cango Caves. To see traveler tips and other tourist information, you can read our Oudtshoorn trip itinerary maker. You can drive from Wilderness to Oudtshoorn in 1.5 hours. Another option is to take a bus. Finish your sightseeing early on the 16th (Wed) so you can drive to Plettenberg Bay. Relax by the water at Brenton on Sea and Buffalo Bay. 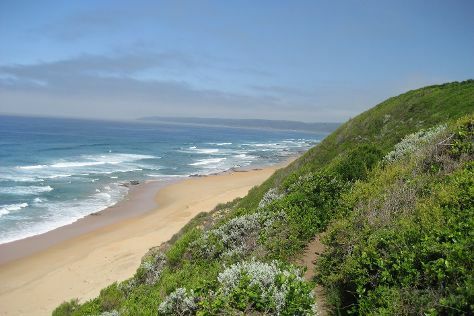 Venture out of the city with trips to Knysna (Knysna Heads & Garden Route (Tsitsikamma, Knysna, Wilderness) National Park). The adventure continues: stroll through Knysna Elephant Park, contemplate the long history of Nelson Bay Cave, do a tasting at Plettenvale Wines, and kick back and relax at Plettenberg Beach. For where to stay, traveler tips, reviews, and more tourist information, refer to the Plettenberg Bay travel planner. You can drive from Oudtshoorn to Plettenberg Bay in 2.5 hours. Alternatively, you can take a bus. In August, plan for daily highs up to 22°C, and evening lows to 13°C. Cap off your sightseeing on the 19th (Sat) early enough to travel back home.